Solids interceptors shall be Rockford Interceptors as manufactured by Rockford Separators, Inc., Rockford, Illinois, and as noted on plans. Furnish ____Rockford Model RPS-____ all-welded steel interceptors for on-the-floor, partially recessed, or flush-with-floor installation. 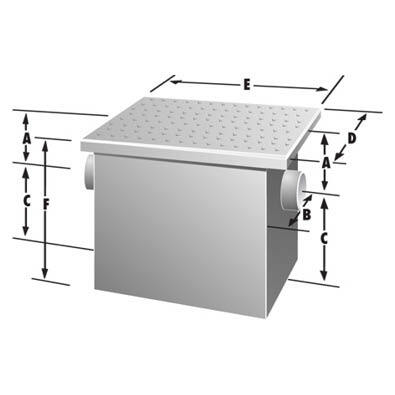 Removable cover sealed with a heavy-duty leakproof gasket and secured with stainless steel flat head screws. Removable sediment basket for ease of cleaning. ____" no-hub inlet and outlet connections. Size to be used with corresponding RP Series Interceptors. Anchor flange with or without clamping ring, integral extension to grade, epoxy coating, all stainless steel construction, tapped inlet/outlet connections, stainless steel sediment basket. For other options, contact our Engineering Department. For use along with corresponding RP Series to intercept solids.